Very good condition refinished Martin Handcraft tenor with a recent overhaul. This is on consignment and priced to sell. Beautiful tenor with a big, warm voice. I don’t see any signs of past damage or repairs. The overhaul was done OK. It’s not a top-shelf job but it gets the job done. Includes the original case. This horn is one-owner and was well cared-for. Pair it with a Brilhart Tonalin tenor piece for a beautiful Tex Benake sort of sound. From “The Martin Story” website, which is the best source on Martin model specifics, we find this nugget of information, which seems right to me also. These horns seem to be a combination of a Handcraft Imperial body (note the Eb vent key, below the low D key) and Handcraft Committee keywork. The fact that these horns where produced at the same time as the Handcraft Committee and Committee 2 combined with some cheaper details (fixed right thumbrest, no heartshaped left thumbrest) makes me think these are somewhat watered-down versions of the Imperial. Here’s a nice, clean, early “The Martin” tenor in original lacquer without any major past repairs, one standard overhaul away from being a blow-the-doors-down dark & woody-sounding vintage tenor, built about as good as anybody ever made a sax, with a unique tone and styling. It does not currently play and is missing some pads, but the pads that are in there are all original. It looks like it has never been taken apart since the day it was built, and it cries out to play again. All it needs is an owner and a conscientious repairer and it will faithfully serve for years to come. These are not often found in such clean shape, and this one is described accurately and priced to sell with no surprises or unhappy discoveries upon receipt, and the equivalent horn you’d see for sale on that nefarious online auction site is likely to be a can o’ worms, a hornet’s nest, and a sack of marmots all at once. Or shortcut all that mess, buy this one, and get started on making it your own. Selmer Mark VI Alto Saxophone 111950 Original Lacquer 1963 Freshly Overhauled and Excellent! 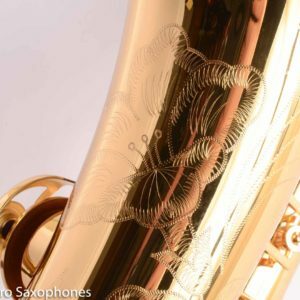 This is a gorgeous original lacquer Selmer SBA Alto Saxophone American engraved and assembled, that is in excellent physical condition AND has a fresh, full overhaul. This horn plays really well, with a lush, wide tone that is medium dark and smooth. The keywork feels great under the fingers – nice and snappy. It has a top quality overhaul, which is very important on a horn like this, and has slightly domed metal resonators, which are similar to the original equipment for an SBA of this vintage. The neck is in excellent condition, body tube, bell flare, and bow are all undamaged. 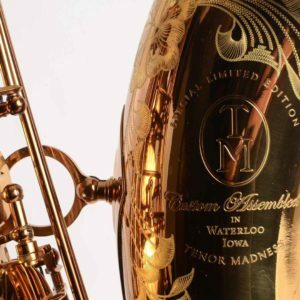 The engraving on this alto is particularly nice, and the exposed part of the brass is developing a beautiful matte patina that accentuates the engraving. This is a horn that looks even better in person than in the photos. It comes from a lifelong saxophone player whose baritone and tenor were also stand out players. He really had three excellent saxophones and this one is no exception. From a player’s perspective, you get the warmth and complexity of a Balanced Action here with slightly more comfortable keywork (offset stack keys so your wrists are more relaxed compared to BA). Plenty of volume, nice easy, saturated low register, even at very low volumes. Easy subtone. Easy altissimo. Feels like a new horn under the fingers but is better built and sounds better. The price includes a new BAM Classic alto saxophone case at no extra charge. One-of-a-kind Selmer Super Sax baritone with original Permagold plate finish. 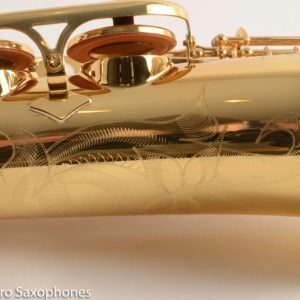 This is ultimate collectible Selmer baritone for the discerning saxophone collector or player. Yamaha YAS-875EXII Custom EX-II Alto Brand NEW with Warranty and Pro Setup Exceptional! This is an excellent physical condition Yamaha Custom 82ZII tenor with a fresh overhaul. The overhaul is very clean and well done, and the pads have domed metal resonators that impart a bit more zing to the tone than the plastic resonators that Yamaha’s typically come with from the factory. So it’s all here: Yamaha quality, intonation, and craftsmanship plus a bit more than usual in the tone department with completely fresh pads, all for $1000 less than a new Yamaha tenor. Hard to go wrong with this horn. Yanagisawa A880 Alto Saxophone Excellent Original Condition Great Deal! This is a very well built professional saxophone that was made in about 1985 by Yanagisawa, a small company in Tokyo that makes only handbuilt professional saxophones. The Yanagisawa 880 is not a very well known instrument, and as such can be bought for much less than it is worth. What it is, besides a very good value, is an amazingly well crafted and very durable professional saxophone that will outlast anyone reading this, given proper care. This particular instrument plays well on its original pads, and looks like it was purchased, played for a few years, and then put away It should continue to play well for a good long while, but plan on repadding it at some point (or have me get that done for you) as the pads, being made of leather and felt, do feel the effects of time even if they are unplayed. This horn is in excellent physical condition, bearing a few small scuffs and scratches here and there from honest use, but it has no evidence of dents or dings, either past or present, and no evidence of any past repairs major or minor. It comes with its original, well-fitting case and original mouthpiece (which looks to have been made by Leblanc, who was their US distributor). This would be a perfect horn for someone looking to get their first professional saxophone, or for a professional player looking for a super solid backup horn. It costs less than and is of a higher quality than the modern Taiwanese/Chinese/Vietnamese imports of various names, will last longer, and will hold its value much better. These horns play very well (this one included) and owning an instrument of such quality craftsmanship is a deeply satisfying experience that deepens the relationship between player and horn. Yanagisawa A901 Alto Saxophone Good Condition Pro Alto All New Pads!